This Sunday Dinner, my mother was making her after Thanksgiving family fave….creamed turkey on toast served with mashed potatoes and any other sides that were served on the BIG DAY. It is the epitome of comfort food and all of us who eat it, feel very lucky to be at her Sunday Dinner that night. I was in charge of bringing dessert. I decided that Boston Cream Pie would be the perfect choice to compliment her dinner. For those of you who are not entirely familiar with this spongy, custard filled dessert, it is actually a cake, not a pie. Yay for that because even though I might be the biggest pie fan of all times, I was done for the time being with the whole pie thing after Thursday and was ready for something different. To my dismay, when I was in the middle of making my cake, I realized I was very low on baking powder and came up 1/4 of a teaspoon short. One other problem I ran into were directions that simply went against my baker’s intuition. My recipe from Gale Gand of Food Network fame demanded that I beat my batter for 3 minutes! That seemed odd to me. Usually gluten forms when over mixing cakes and thus they tend to come out a bit tough, but she is one of my all time favorite icons from the Food Network back in the day when Emeril was their only star. If Gale told me to mix on high for three minutes, I’ll be damned if I was going to tell her, “No!”. Well, I should have told her no because my cake was just a hair tough. My missing baking powder probably didn’t help the entire equation either. But, just when I thought all hope was lost for a delectable dessert, my dark 72% chocolate ganache came to save the day. After topping the first layer of cake with the beautiful vanilla custard, I slathered a thick, decadently dark chocolate ganache over the top. Of course, with the little dollops of left over ganache, just sitting around waiting to be useful, I stuck a finger in and tasted it. HEAVEN! Things were beginning to look up. The oh-so-dark chocolate pairs with the creamy vanilla custard better than any famous couple in history. The sponge cake was there for the ride and it was very good, but next time I know that I will only mix it for a minute and will be sure to have ALL my ingredients on hand. Here is my little list of things that Chocolate Ganache can fix. 1. Cracks in cakes…use it like spackle. 2. A frosting that didn’t turn out right…just make Ganache and toss the frosting. 3. Ugly cakes. Pour over and voila, you have a beautiful cake. 4. One very bad day. Dip strawberries in it and your day instantly gets better. 5. Jazz up any cookie for a party by drizzling thinned chocolate ganache back and forth over a sheet of cookies. Helpful hint, use a cooling rack and place a piece of foil below. Makes for easy clean-up. 6. Bringing a fruit platter to a party? Have a pretty little bowl filled with chocolate ganache along side it. Your fruit will be memorable. Do you have any Chocolate Ganache ideas to add? For the Cake: Preheat oven to 350 degrees. In a medium mixing bowl combine flour, sugar, baking powder, and salt. Make a well in the center of the flour mixture. Add milk, oil, egg yolks, and vanilla. Beat with an electric mixer on low to medium speed until combined. Beat an additional minute on medium speed and set aside. In a large mixing bowl, beat egg whites and cream of tartar on medium to high speed until soft peaks form. Pour the egg yolk mixture over the egg white mixture and fold in. Gently pour the batter into a 9-inch greased cake pan. I like to cut a circle of parchment paper by tracing the bottom of my cake pan. Then I butter my pan, place the parchment paper on top of the greased pan, and then butter the parchment paper as well. Flour the entire pan and knock the pan upside down over the sink to remove excess flour. Bake for 25 to 30 minutes or until the top springs back when lightly touched. Invert the pan onto a wire rack. Cool completely. To assemble pie, remove the cake from the pan. Cut the cake in half horizontally. Place bottom layer on a serving plate or board, and spread with the pastry cream. Top with second cake layer. Spread chocolate ganache over the top of the cake. Store in refrigerator. I totally agree! Actually, I only had enough eggs to make 2/3 of the custard recipe so it really should have had more. Wow, this look really good! Just that filling alone will be heavenly. Creamy and totally decadent. It’s a nice comfy dessert. I’m telling you… my vice is chocolate.. soo good. Mine too Babygirl, mine too. Wow that looks rich! And rather yummy! I have never cut a cake horizontally… I’d be afraid that would go horribly wrong. I can’t cut bagels evenly, so how would I have a chance at cutting a cake into two even horizontal slices?? Any tips?? HA!!! I should post the photo of the bottom layer before the custard was spread on. I am the last one that should give tips. I have heard there is such a thing that is called a cake leveler which is supposed to make it easy. Another recommendation I have read is to use fishing wire instead of a knife. I just went for it with a serrated bread knife and it was a bit wobbly but it didn’t matter. This is definitely a comfort dessert, the custard looks yummy. Chocolate and chicken soup can cure most any ailment as far as I’m concerned. I love Boston Cream pie. It’s hard to believe that Gale could let one down but I think your pie looks delicious. 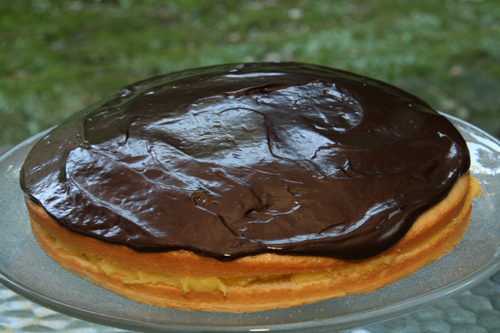 Geni, love Boston cream pie…so light and yet flavorful with the pastry cream. Will have to try this soon. Mmmm, Boston cream pie is wonderful! It has been so long since I have had it that I’d almost forgotten about it! (Sad, right?!?) Thanks for the reminder! Oh I’m drooling over all those layers! omg, I think I’m having a foodgasm just looking at the pie! & I love how you didn’t skimp on the filling! Looks amazing! Yes, my favorite is a chocolate tart, basically a tart filled with chocolate ganache – maximum chocolate ganache consumption! 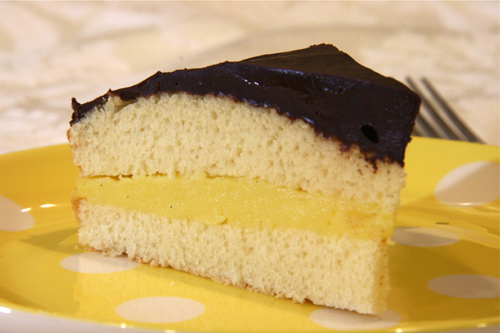 Your Boston Cream Pie looks absolutely wonderful – so good. 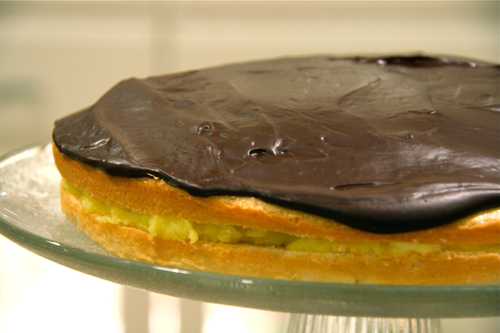 A tart is divine with “just” chocolate ganache. This is one delicious Boston Cream Pie. It has been a long time since I had this CAKE. The Ganache is perfect. Your recipes are always yummy. I’ve been wanting to make eclairs. Do you think I can use the same custard and ganache for that? Great ganache suggestions! I’m with you. You can never go wrong by underbeating once the flour has been added. What a delicious dessert. I love Boston Cream pie. Certainly, I would love this. I appreciate your comment about the power of ganache. I Love this pie. Looks very scrumptious. I love the filling of custards and pies, especially boston cream pie. I would love a piece right now.